The limestone relief works in the tomb of Seti I and those in the temple he built at Abydos are the finest in all of Egyptian history and among the greatest works of art in the world. It is curious that art should reach this height under this pharaoh, a military man, and then decline in the bigger-is-better attitude of his son Rameses II. While specific compositions are justly well respected, the overall standard is truly extraordinary. The artists worked in teams, their names are not known. 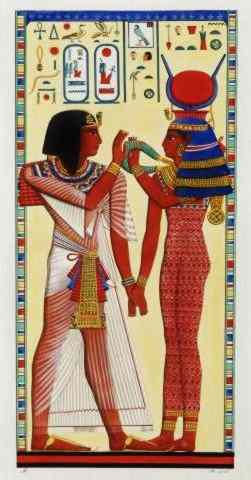 Perhaps there was one master who was able to bring the skill of a number of artists to such a high level, or perhaps it was Pharaoh Seti himself who so encouraged and inspired his workers. These artists expected their work to be sealed in the tomb for all time. Fortunately for us, over 3000 years later their work is to some degree available in reproductions such as these. On the 16th October, 1817 I recommenced my excavations in the valley of Beban el Malook (the Valley of the Kings), and pointed out the fortunate spot, which has paid me for all the trouble I took in my researches. I may call this a fortunate day, one of the best perhaps of my life. Fortune has given me that satisfaction, that extreme pleasure, which wealth cannot purchase - the pleasure of discovering what has been long sought in vain, and of presenting the world with a new and perfect monument of Egyptian antiquity. A tomb which can be recorded as superior to any other in point of grandeur, style, and preservation, appearing as if just finished on the day we entered it. by J. Ricci, an artist in the Belzoni expedition, 1820. I caused the earth to be opened at the foot of a steep hill, under a torrent, which, when it rains, pours a great quantity of water over the very spot I have caused to be dug. No one could imagine that the ancient Egyptians would make the entrance into such an immense and superb excavation just under a torrent of water, but I had strong reasons to suppose that there was a tomb in that place from indications I had observed in my pursuit. The Fellahs who were accustomed to dig were all of opinion that there was nothing in that spot, as the situation of this tomb differed from that of any other. I continued the work however, and the next day, the 17th, in the evening, we perceived that part of the rock was cut, and formed the entrance. On the 18th, early in the morning, the task was resumed and about noon the workmen reached the entrance, which was eighteen feet below the surface of the ground. The appearance indicated that the tomb was of the first rate, but still I did not expect to find such a one as it really proved to be. The Fellahs advanced till they saw that it was probably a large tomb when they protested they could go no farther, the tomb was so much choked up with large stones which they could not get out of the passage. I descended, examined the place, pointed out to them where they might dig, and in an hour there was room enough for me to enter through a passage that the earth had left under the ceiling of the first corridor. 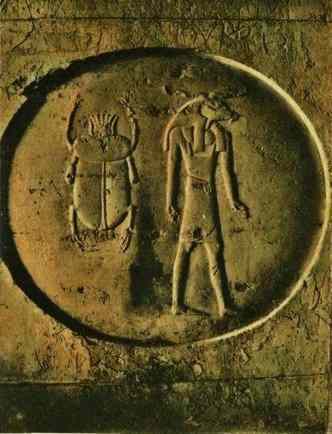 I perceived immediately by the painting on the ceiling, and by the hieroglyphics in basso relievo, which were to be seen where the earth did not reach, that this was the entrance into a large and magnificent tomb. At the end of this corridor I came to a staircase twenty-three feet long. From the foot of the staircase I entered another corridor, each side sculptured with hieroglyphics in basso relievo, and painted. The ceiling also is finely painted, and in pretty good preservation. The more I saw the more I was eager to see, such being the nature of man, but I was checked in my anxiety at this time, for at the end of this passage I reached a large pit which intercepted my progress. This pit is thirty feet deep, and fourteen feet by twelve feet wide. The upper part of the pit is adorned with figures. The passages from the entrance all the way to this pit have an inclination downward of an angle of eighteen degrees. On the opposite side of the pit facing the entrance I perceived a small aperture two feet wide and two feet six inches high. At the bottom of the wall there was a quantity of rubbish. A rope fastened to a piece of wood that was laid across the passage against the projections which form a kind of door, appears to have been used by the ancients for descending into the pit. From the small aperture on the opposite side hung another rope which reached the bottom, no doubt for the purpose of ascending. We could clearly perceive that the water which entered the passages from the torrents of rain ran into this pit. The wood and rope fastened to it crumbled to dust on touching them. At the bottom of the pit were several pieces of wood, placed against the side of it, so as to assist the person who was to ascend by the rope into the aperture. I saw the impossibility of proceeding at the moment. 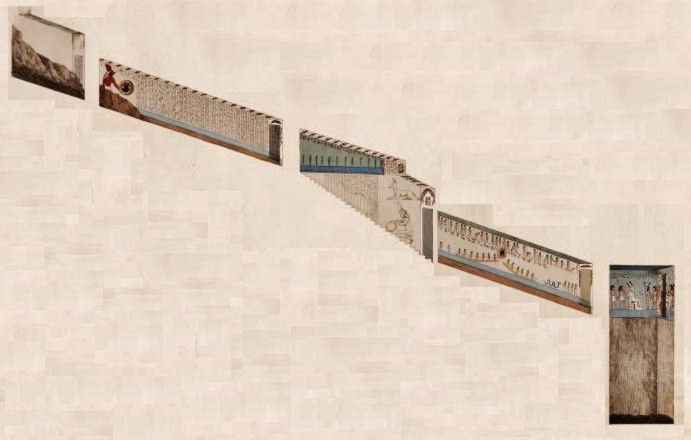 The next day, the 19th, by means of a long beam we succeeded in sending a man up into the aperture, and having contrived to make a bridge of two beams, we crossed the pit. The little aperture we found to be an opening forced through a wall that had entirely closed the entrance, which was as large as the corridor. 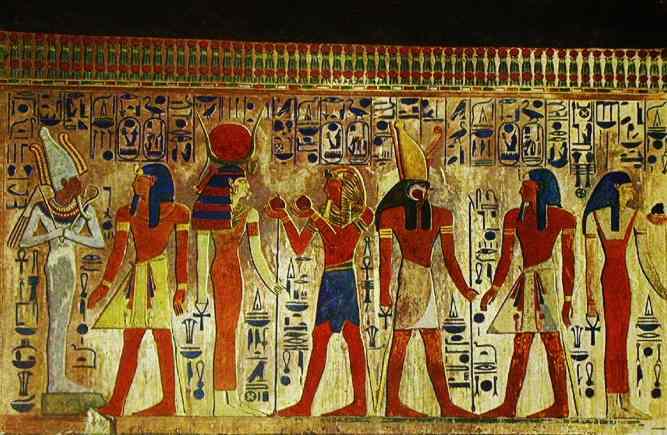 The Egyptians had closely shut it up, plastered the wall over, and painted it like the rest of the sides of the pit. But for the aperture, it would have been impossible to suppose that there was any farther to proceed. Any one would conclude that the tomb ended with the pit. The rope in the inside of the wall did not fall to dust, but remained pretty strong, the water not having reached it at all. The wood to which it was attached was in good preservation. It was owing to this method of keeping the damp out of the inner parts of the tomb that they are so well preserved. I observed some cavities at the bottom of the well, but found nothing in them, nor any communication from the bottom to any other place. We could not doubt it being made to receive the waters from the rain, which happens occasionally in these mountains. When we had passed through the little aperture we found ourselves in a beautiful hall, twenty-seven feet by twenty-five feet, in which were four pillars three feet square. In the front of this first hall, facing the entrance, is one of the finest compositions that ever was made by the Egyptians, for nothing like it can be seen in any part of Egypt. It consists of four figures as large as life. 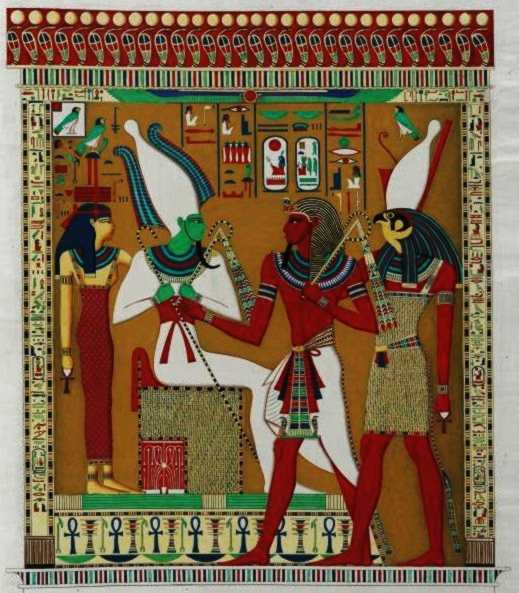 The god Osiris sitting on his throne, receiving the homage of a hero, who is introduced by a hawk-headed deity. Behind the throne is a female figure as if in attendance on the great god. The whole group is surrounded by hieroglyphics, and enclosed in a frame richly adorned with symbolical figures. The winged globe is above, with the wings spread over all, and a line of serpents crowns the whole. The figures and paintings are in such perfect preservation, that they give the most correct idea of their ornaments and decorations. At the end of this room, which I call the entrance-hall is a large door, from which three steps lead down into a chamber with two pillars. This is twenty-eight feet by twenty-five feet. I gave it the name of the Drawing-Room, for it is covered with figures which, though only outlined, are so fine and perfect that you would think they had been drawn only the day before. Returning into the Entrance-Hall, we saw on the left of the aperture a large staircase which descended into a beautiful corridor. We perceived that the paintings became more perfect as we advanced farther into the interior. They retain their gloss, or a kind of varnish over the colors, which had a beautiful effect. The figures are painted on a white background. At the end of this corridor we descended ten steps, which I call the small stairs, into another corridor. From this we entered a chamber, twenty feet by thirteen feet, to which I gave the name of the Room of Beauties; for it is adorned with the most beautiful figures in basso relievo, and painted. When standing in the center of this chamber the traveler is surrounded by an assembly of Egyptian gods and goddesses. from the room of beauties, tomb of Seti I. Both reliefs were cut from the wall by the Champollion expedition. (L) Reproduction by S. Cherubini from that expedition, 1832, now in Italy. (R) photo from the Louvre, Paris (EgyptArchive). The entrance is decorated with two figures, on each side, a male and a female, as large as life. The female appears to represent Isis, having, as usual, the horns and globe on her head. She seems ready to receive the hero, who is about to enter the regions of immortality. The garments of this figure are so well preserved that nothing which has yet been brought before the public can give a more correct idea of Egyptian customs. The figure of the hero is covered with a veil, or transparent linen, folded over his shoulder and covering his whole body, which gives him a very graceful appearance. Isis is apparently covered with a net, every mesh of which contains some hieroglyphic, serving to embellish the dress of the goddess. The necklace, bracelets, belt, and other ornaments are so well arranged that they produce the most pleasing effect, particularly by the artificial lights, all being intended to conduce to this purpose. Proceeding farther, we entered a large hall, twenty-seven feet by twenty-six feet. In this hall are two rows of square pillars, three on each side of the entrance, forming a line with the corridors. At each side of this hall is a small chamber. This hall I termed the Hall of Pillars; the little room on the right, Isis's Room, as in it a large cow is painted, of which I shall give a description hereafter; that on the left, the Room of Mysteries, from the mysterious figures it exhibits. At the end of this hall we entered a large saloon with an arched roof or ceiling, which is separated from the Hall of Pillars only by a step; so that the two may be reckoned one. The saloon is thirty-one feet by twenty-seven feet. The room of beauties, hall of pillars and saloon, tomb of Seti I. On the right of the saloon is a small chamber without any thing in it, roughly cut, as if unfinished, and without painting: on the left we entered a chamber with two square pillars, twenty-five feet by twenty-two feet. This I called the Sideboard Room, as it has a projection of three feet in the form of a sideboard all round, which was perhaps intended to contain the articles necessary for the funeral ceremony. We entered by a large door into another chamber with four pillars, one of which is fallen down. This chamber is forty-three feet by seventeen feet. It is covered with white plaster, where the rock did not cut smoothly, but there is no painting on it. I named it the Bull's, or Apis' Room, as we found the carcass of a bull in it, embalmed with asphaltum; and also, scattered in various places, an immense quantity of small wooden figures of mummies six or eight inches long, and covered with asphaltum to preserve them. There were some other figures of fine earth baked, coloured blue, and strongly varnished. On each side of the two little rooms were some wooden statues standing erect, four feet high, with a circular hollow inside, as if to contain a roll of papyrus, which I have no doubt they did. We found likewise fragments of other statues of wood and of composition. The roof of the burial chamber (saloon) contained two so-called zodiacs. By artist J. Ricci, 1820. But the description of what we found in the center of the saloon, and which I have reserved till this place, merits the most particular attention. There is not its' equal in the world, and being such as we had no idea could exist. It is a sarcophagus of the finest oriental alabaster, nine feet five inches long, and three feet seven inches wide. Its thickness is only two inches; and it is transparent when a light is placed in the inside of it. It is minutely sculptured within and without with several hundred figures, which do not exceed two inches in height, and represent as I suppose, the whole of the funeral procession and ceremonies relating to the deceased. I cannot give an adequate idea of this beautiful and invaluable piece of antiquity, and can only say, that nothing has been brought into Europe from Egypt that can be compared with it. The cover was not there. It had been taken out and broken into several pieces, which we found in digging before the first entrance. The sarcophagus was over a staircase in the center of the saloon, which communicated with a subterraneous passage, leading downwards three hundred feet in length. It was nearly filled up by the falling in of the upper part. I measured the distance from the entrance, and also the rocks above, and found that the passage reaches nearly half way through the mountain to the upper part of the valley. I have reason to suppose that this passage was used to come into the tomb by another entrance. This could not be after the death of the person who was buried there, Seti, for at the bottom of the stairs just under the sarcophagus a wall was built. Some large blocks of stone were placed under the sarcophagus horizontally, level with the pavement of the saloon, that no one might perceive any stairs or subterranean passage was there. 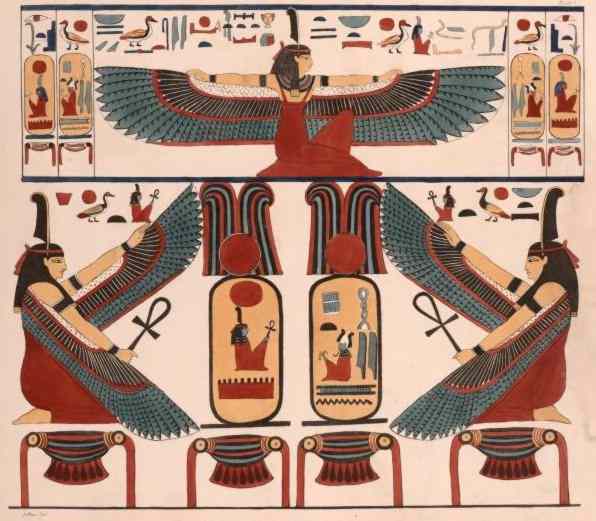 With the assistance of Mr. Ricci I have made drawings of all the figures, hieroglyphics, emblems, ornaments, etc. that are to be seen in this tomb; and by great perseverance I have taken impressions of every thing in wax. To accomplish the work has been a laborious task, that occupied me more than twelve months. The drawings show the respective places of the figures, so that if a building were erected exactly on the same plan, and of the same size, the figures might be placed in their situations precisely as in the original, and thus produce in Europe a tomb in every point equal to that in Thebes. It is useless to proceed any further in the description of this heavenly place, as I can assure the reader he can form but a very faint idea of it from the trifling account my pen is able to give. Should I be so fortunate, however, as to succeed in erecting an exact model of this tomb in Europe, the beholder will acknowledge the impossibility of doing it justice in a description. 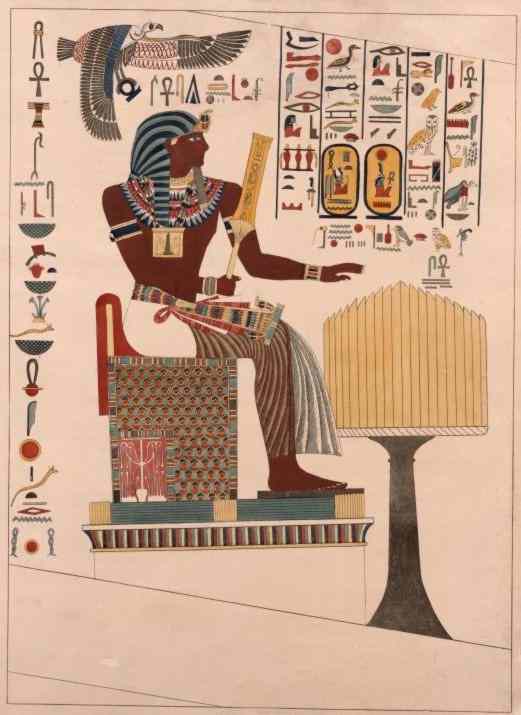 From: "Narrative of the Operations and Recent Discoveries Within the Pyramids, Temples, Tombs and Excavations in Egypt and Nubia"
by Giovanni Battista Belzoni, 1820. 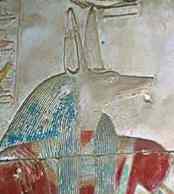 Pharaoh Seti I, from the second descending passage. By J. Ricci, artist in the Belzoni expedition. Mr. Belzoni did create in London a replica of two rooms from the tomb of Seti I. It would be worthwhile to have such an exhibition open today. The alabaster sarcophagus of Seti I was removed to England and sold to a collector. It is now in a private museum. Hand colored photo, Elysian Fields. Deir el Medina: The extraordinary Tombs of the Craftsmen.